One of the benefits of working with a food blogger is that my colleagues sometimes get to taste the fruits of each weeks labour. This Christmas, I thought I would make something just for them. 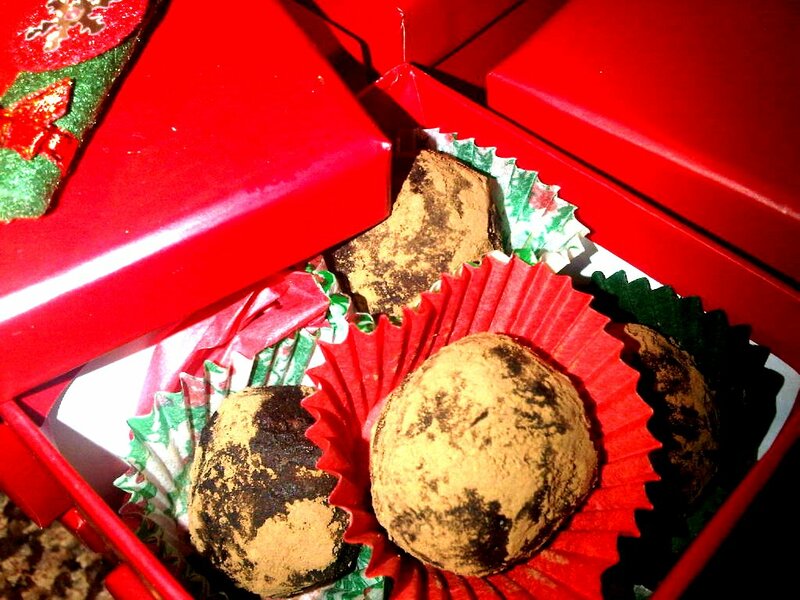 I decided to try out my own variation of rum truffles that I used to make as a kid, instead of rum, using Kahlua. The truffles are super rich so a few are plenty and one bite keeps your chocolate intake up over the holidays! They aren't exclusively a Christmas chocolate. In the past I've made them for Valentine's Day gifts and filled Easter Eggs with them, so they're pretty versatile - for any day of the year where Chocolate is an appropriate gift (read, any day of the year!) I chose a festive presentation and gave everyone a little box decorated in Christmassy style! These truffles sound delicious! I love kahlua. Friends of food bloggers are very lucky people!